I’ve signed up for a hand embroidery class! It doesn’t start until October 30th, but it has already filled up! There will be a kit to purchase at the first class. Since I’m a beginner, I asked if this class would be appropriate for me, a newbie. And I was assured it would be a good class for learning, I think she said 14 different stitches. I’m hoping I can handle it! This week’s progress: I got a few more Dancing Star blocks underway. And the FMQ squiggles are all completed on Chic Country. On to the next section! 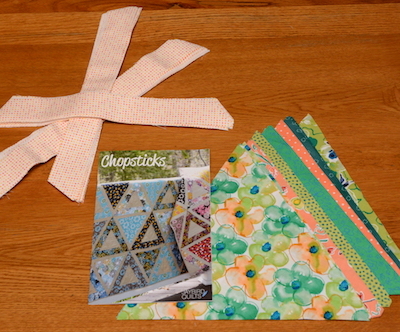 I have 2 more designs to quilt on Chic Country. I hope to finish it this month. Road trip! I had a blast with my friends. We visited Caroline’s Cottage Cottons in Rome City, IN. Caroline is a delightful person. Her shop is adorable. 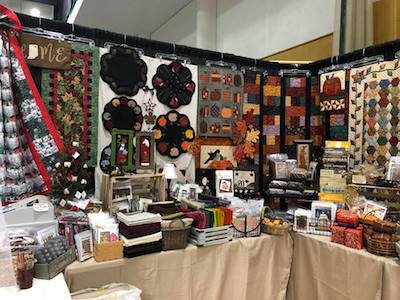 And her shop was one of the 10 top shops featured in the Fall 2018 Better Home & Gardens Quit Sampler Magazine. !!!! Yes, I bought a copy of the magazine and asked Caroline to autograph it! Check her out on Facebook. Photo from her recent vending at the Ohio One Stop Shop Hop. From the quilt shop we went to Turkey Lake Tavern in Elmira for lunch. I recommend their fish special. Yum! That should be it for this coming week. How was your week? Starting anything new? 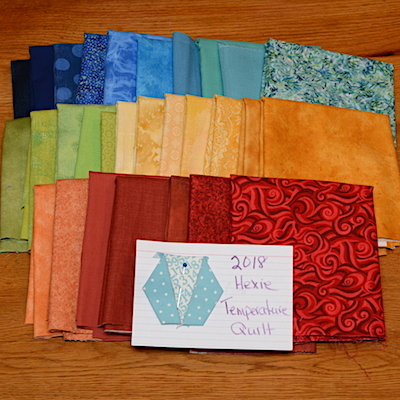 My goal for February was to organize everything for the temperature quilt I want to stitch this year. I pulled fabric from my stash, and bought the rest in 1/3 yard pieces. 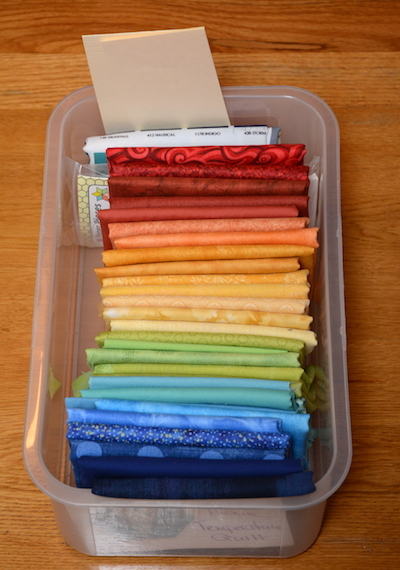 I even got the fabric organized by temperature in to this little storage bin. I dug around the studio for needles. And then bought better needles while on a shop hop. I started stitching with a 12 weight thread from my stash, then bought Presencia thread for hand embroidery,which is working out much better. After playing with the pieced hexie shape, I changed it and settled on the wider base center, instead of the ‘V’ center. I have settled on using the high temp and low temp for each day. The center piece of the hexie is the high of the day, and the two side pieces are the low of the day. I’m stitching them together with a thread the color of the low for the day. I’m only using four thread colors. Now that I’m all settled on fabric, pieced hexie shape, needles, thread, and technique, it’s time to get cracking and caught up. 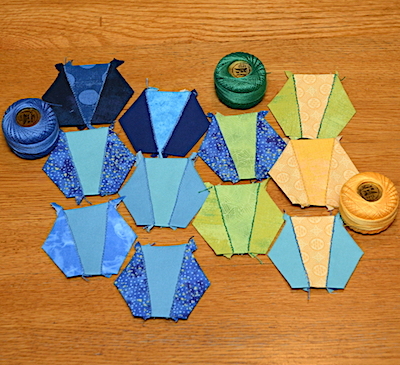 It’s slow going right now, but with making 365 hexies this year, I figure I’ll be a pro by the end of the year! Instead of using a whip stitch on the back side to attach the hexie pieces together, I’m doing an embroidery stitch on the right side. I’ll show more about the stitch once I’m better at stitching the hexies together. One of my goals for 2018 is to learn, and hopefully enjoy handwork! I’m linking to One Monthly Goal over at Patty’s blog Elm Street Quilts. Go check out the other goals meet for February and join in for March! My quick trip east with family over the weekend went well. I arrived home late last night. My Mother passed away Sunday, February 4th at the age of 89. She will be missed, but we enjoyed our time with family and friends celebrating her life. Oh the stories that were shared! I’ll spare you, but we had our laughs and tears. She was quite a lively and godly lady! Years ago, my mother gave me a hand embroidered ‘blanket’ that was made long before my time by the ladies of the church I attended as a child. 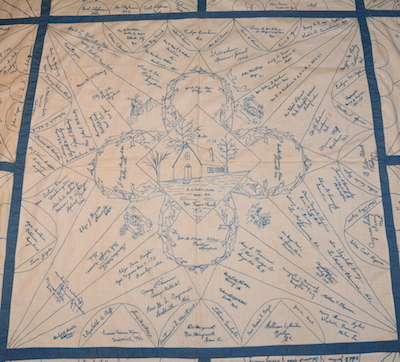 I believe it was a fundraiser where families purchased a square for their name to be embroidered in to the blanket. Kind of a memorial of members and friends at the time. I don’t know if it was auctioned off at some point, but it was in my grandmother’s possession when she passed away in 1994. My mother gave it to me. I’m not sure why, maybe she thought I’d appreciate it as a quilter. But, I always thought I should not be its “keeper” as it belonged with Mt. Paran Church in Maryland, not with me in the Midwest. The church kindly provided refreshments for our family and guests after the burial in what they now call the Historic Chapel as this structure is believed to be one of the oldest in the area established in 1718, 300 years ago! I spoke with the Session Clerk and Associate Pastors telling them the story of the embroidered blanket. They were delighted to learn about the blanket and will be happy to once again have it in the church’s possession, as I promised to return it to its rightful owners. My son wants to take proper photos of all the embroidered squares before I ship it off. As I took a closer look at the squares today, I found one was completed by my grandmother, and another by her younger sister. Dated 1914. My grandmother would have been 21 years old when she did this hand work! 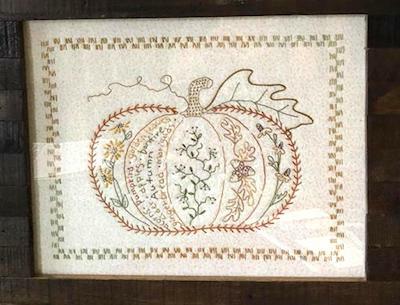 This piece of embroidery is an amazing piece of history! Beautifully handcrafted! If any of you know the proper name for the embroidery piece, please let me know! As for my to-do list for this week, I decided on prepping Chopsticks, pattern by Jaybird Quilts. I’m using fabrics I purchased from Craftsy in one of their mystery boxes and also fabric from a LQS, all purchased about 3 years ago. 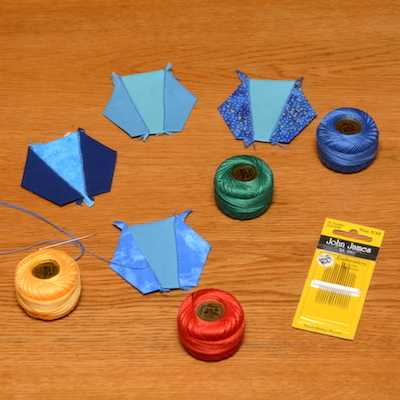 I got all the fabrics cut and even some of the triangles block piecing started. Pack and ship the Mt. 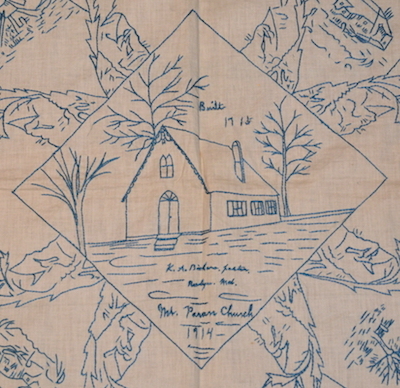 Paran embroidered blanket. Finish shopping for fabric for the Temperature quilt and attack the Hexies! In the photo above, 1 celebrated a January birthday, 2 celebrate February birthdays, 4 celebrate March birthdays. One is the odd ball out with a November birthday. My youngest daughter, missing from the photo, celebrates a March birthday! Plus 2 more missing with an April birthday and a June birthday. On March 4th we did a family celebration for all the February & March birthdays at one time. 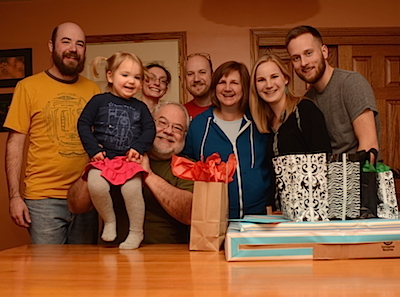 The 4th was my husband’s birthday (sitting holding up our grand daughter.) 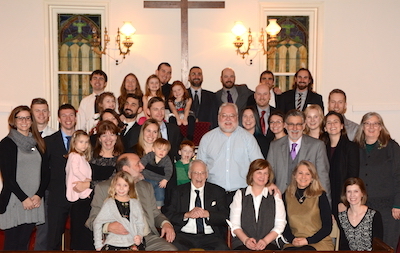 It was so nice to have 2 of our out-of-town adult children and their spouse/family come visit for the weekend of celebrations. I’ve seen this color wheel pop up a few times over the past several years on various blogs. A class for it and other embroidery are offered by Rebecca Ringquist on Creativebug. 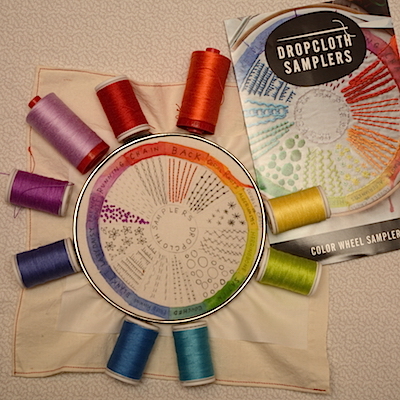 I found I could buy the sampler from her Dropcloth Samplers Etsy shop. So I took the plunge and bought it as a Birthday present to me! I’ve been wanting to learn embroidery, and thought this sampler might be just the way to ‘wet my feet’. I had several 12 weight threads on hand from Aurifil and Superior Threads, but as you can see I need just a few more to complete the color wheel. I do have to wonder about my sanity! With all the piecing, quilting, binding of quilts I have planned, why am I taking on another project!? How about you? Are you adding a new craft/skill to your list this year? Last week’s To-Do Tuesday List, how did I do? Continue working on 2 charity quilts. ✔️ I’ve have quilted a few stars, pictures when complete. Continue FMQ sampler. ✔️ Top quilted and ready to bind! Set up time to meet with my friend making pillow cases. ✔️ She stitched 14 pillow cases, and I cut fabrics for 13 more! My husband’s Spring Break (college professor) starts this Friday and runs thru March 12th. I don’t think I’ll be getting much done in the sewing room. I’ll be happily spending the week with him! Continue working o 2 charity quilts. Sewing day this Thursday with Curvy Quilters.